Driven by a powerful yet highly energy-efficient V8 6.7L turbo diesel engine mounted on a modified Ford chassis, the 4×4 SandCat’s acceleration, speed and maneuverability enable it to get in and out of tight situations fast – even when it’s carrying up to 12 fully equipped fighters. A true all-terrain vehicle, the SandCat is able to ford streams, cross trenches, climb vertical steps, handle steep inclines and hazardous side slopes and to cruise at speed across sand, rocks, mud and ice. With acceleration of 0-60mph (96.5km/h) in 23 seconds, electronically limited top speeds of 75mph—120km/h, and a tight 40ft/12.3m turing circle, the SandCat delivers outstanding on and off-road performance. SandCat – high performance, all-terrain 4×4 for every arena. 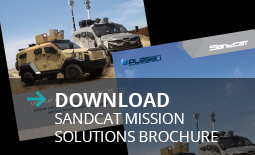 Based on decades of battle-proven armor development, the SandCats advanced lightweight composite armor provides up to STANAG Level 3 protection without adding to the vehicle’s GVW or compromising its outstanding performance. Incorporating the best of the innovative Kitted-hull concept, the SandCat’s flexible production means that critical components such as crew cabin, engine and transmission can each be manufactured with maximum armor protection. The modules are based on GVA/NGVA standard embedded within the vehicle infrastructure. The systems and modules allow optimally meeting the particular needs of each client, enhance operational flexibility in a wide range of scenarios and support easy adaptation to a dynamic environment.